Cold temperatures on Wednesday mean wet spots on the roads left by Tuesday’s storm can quickly turn to ice. Texas Department of Transportation trucks are loaded up with sand and hit the roads to treat those slippery spots. For the most part, roads are clear. Crews are warning commuters not to get overly confident or accidents can happen. The driver of an SUV lost control at about 2 a.m. Wednesday on an icy patch on northbound Central near McCommas and Mockingbird. The SUV spun out and hit the wall. No one was seriously injured. TxDOT sand crews are out cruising around the seven county area and responding to complaints about slippery spots. They’re also sanding the typical hot spots like Woodall Rogers and the High Five. Any sand dispensed, quickly gets picked up by tires. Workers expect it will be an ongoing process all morning. Crews are working 12 hour shifts. About half of the 175 trucks were deployed in Tuesday’s storm. 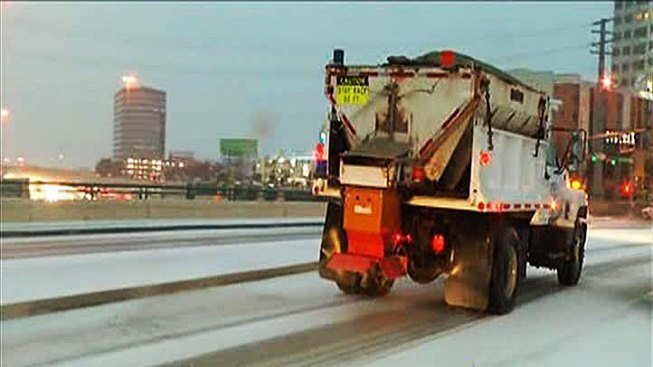 There are fewer crews working the roads on Wednesday. The North Texas Tollway Authority plows and trucks are also on standby at the Dallas North Tollway. Drivers are urged to slow down and allow extra room between cars.